PrestoPlot® is a simple and user-friendly tool for plotting time-based data (telemetry, simulation results, experimental records, etc.). Initiated in 2003 to plot satellite telemetry parameters, it has evolved into a general-purpose plotting tool for time-based data, suitable in numerous industrial domains. 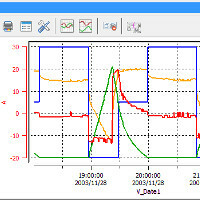 PrestoPlot lets the user plot graphs simply through its graphical interface, without relying on yet another command language. 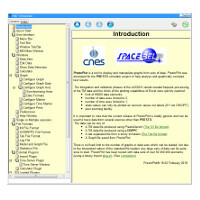 It offers advanced features such as multiple axes and side-by-side plotting of numerical and labelled data. Its high usability makes it a valuable tool for data analysis, and brings to the table elegant solutions to common problems encountered when plotting time-based data (correlation of data sets from separate sources, repeatability of processing, etc.). As a pledge of maturity, PrestoPlot® is used in control centres for the CNES' mini- and micro-satellite series, as well as by a growing number of users at CNES and its industrial partners. The current version is PrestoPlot® 19.03. The next version of PrestoPlot is not yet planned. 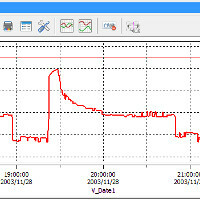 PrestoPlot® facilitates the graphical representation of dated information, such as telemetry, experimental recordings or even simulation results. It has been optimized to manipulate millions of points, which can be viewed on any number of categories and ordinates. PrestoPlot® compensates for the shortcomings of some commonly used software to visualize this kind of data. At last, you can fully devote yourself to data analysis ! With PrestoPlot®, the addition or deletion of a set of data on an already existing chart is possible by simple drag & drop. Model files let you manage various representations (colours, layers, symbols, labels, etc.) for the various types of data you need to handle. With PrestoPlot® you can create new data sets from formulas applied to the source data. It is thus possible to trace e.g. the difference between two data sets. The flexibility of the software also allows the comparison of data recorded on disjoint time slots, or at different sampling instants. PrestoPlot® can be extended through plugins for additional file loading capabilities, new calculator functions, or even completely custom new features ! Also, through plugins, PrestoPlot® interfaces with CNES' VTS visualisation toolkit and can provide its advanced plotting capabilities during VTS visualisations. PrestoPlot® includes a comprehensive user manual that is directly accessible from the software interface ! Which operating systems does PrestoPlot® run on ? PrestoPlot® should also run fine on other Windows and Linux versions. Why does PrestoPlot® fail to start on my 64bits Linux machine ? PrestoPlot® is a 32-bits binary and thus requires 32-bits libraries to run. Such libraries are generally available as compatibility libraries for Linux 64-bits systems. In order to install them, please contact your system administrator. Why can't I run PrestoPlot® on a headless Linux machine if I'm only using batch mode ? Since PrestoPlot® uses Tk, it requires the X11 libraries to run, and a working X11 display. This is still the case even in batch mode. Upon start, PrestoPlot® unpacks and loads some internal libraries into $TMPDIR (/tmp by default). If $TMPDIR is mounted with the noexec option (execution of binaries is forbidden), those libraries will fail to load.